What is a Neo Angle Shower Door? - A neo angle shower enclosure is another type of corner shower door. It has three glass sides and two wall enclosures, creating a beautiful diamond shape. The neo angle shower essentially looks like a corner shower door with the front corner sliced off. The walls can be many combinations of full, half, and glass sides, making this type of shower one of our most versatile. 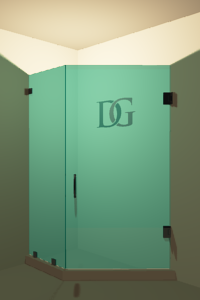 Pro Tip for Neo Angle Shower Enclosures: Shower Door Angles - Your neo angle shower enclosure will be created using 135° angles where the glass meets at the front of the shower, and 90° everywhere else. This little tidbit of information is useful in making sure your shower door fits together perfectly! The width of a neo angle shower door can normally range between 22" and 36". Typically the door cannot be wider than 36” because of the building codes. 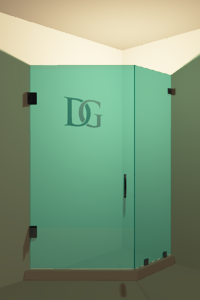 If you do need it to be wider, we will typically add a glass panel to make up the difference of the size needed. 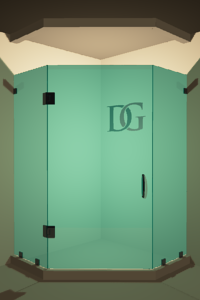 The height of your shower enclosure can be a maximum of 96" tall. 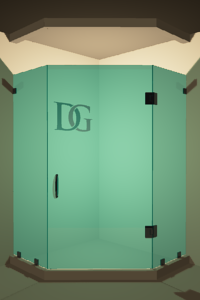 A common size for your neo angle shower enclosure will be around 72” tall. The maximum height of the door depends on the width and relates to the overall weight of the final product. If you have an existing neo angle shower door, such as an old, framed one, you’re in the right place! A new, frameless neo angle shower door can be yours in under 10 days! If you are remodeling a larger bathroom or one with lots of unique considerations, a neo angle shower enclosure might be right for you. The classic diamond-shaped neo angle shower enclosure is a staple in the historic homes of the DC metropolitan and surrounding areas. Areas like Fairfax, VA and Loudon County, VA are jam-packed with historic architecture and homes. 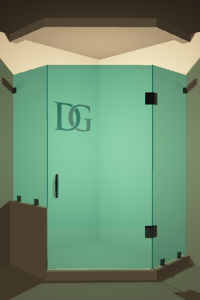 If you’re remodeling a historic home in the Northern Virginia, DC, or Maryland areas, Dulles Glass has the experience to get the best shower for your space, no matter how unique. Crooked walls? No problems. Sloped ceilings? We’ll tackle these issues for you. With our proprietary laser-based measurement system and expert installers, older homes are not a problem for us! Door Opening: Doors open either from the left or from the right. This may be important because of the other elements that are in your space. Glass Shower Panels: Neo Angle shower enclosures will have either 3 glass panels or up to 5, depending on the size of your shower space, or other considerations such as the knee- or half-walls around your shower to accommodate item like your vanity or toilet. Keep in mind, you’ll have worked out the details of your bathroom with your contractor if you are remodeling. Once all the new tiles are installed and everything is ready to go, we can come out and measure for the glass panels that will make up your new neo angle shower enclosure. If you’re replacing an outdated neo angle shower enclosure you already have, we can come out to measure the space.